JPA Art Services offer a professional, reliable and affordable art transport, fabrication and installation service to artists, galleries and collectors. JPA Art Services is owned and managed by James Alderson. Once a practicing artist himself, James has a genuine appreciation of art works and understands the value the artist and gallery place on expert handling, installation and fabrication. 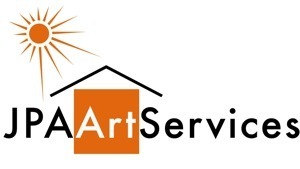 JPA Art Services have worked with many galleries, organisations and artists. Click here to see links to recent clients, or take a peek at our Twitter feed. Using a large, modern, 3.5 tonne van, fully equipped and considerately driven. Vehicle load dimensions 3.1m long x 1.9m high x 1.7m wide. Tail lift vehicles available upon request. Transport day rate (half days available) including technician and vehicle from only £150. Insurance included up to the value of £100,000. Please see t&c. An additional charge is made for fuel etc. currently at 35p per mile. Mileages are calculated using Google Maps. Gallery quality plinths made to measure also flat pack, collapsable plinths available, ideal for touring shows and exhibitions. We can also fabricate many other items you may require, form exhibition shelving, gallery benches and light boxes to actual art objects themselves. Wrapping materials can be supplied. Bespoke crates and transport frames manufactured at affordable rates. Different grades available to suit budget and requirements from plastazote lined museum spec. to unlined basic crates. All can be supplied fire retardant and ISPM No15 compliant for export. Technician work, Artwork installation, site preparation, audio visual installations, space building, temporary exhibition walls, joinery and painting, etc. in the gallery, office or home. Teams of technicians can be arranged, call or email for more details. Please note the above prices are intended as a guide only and that fees may vary.